Most of the time, my life looks like this. 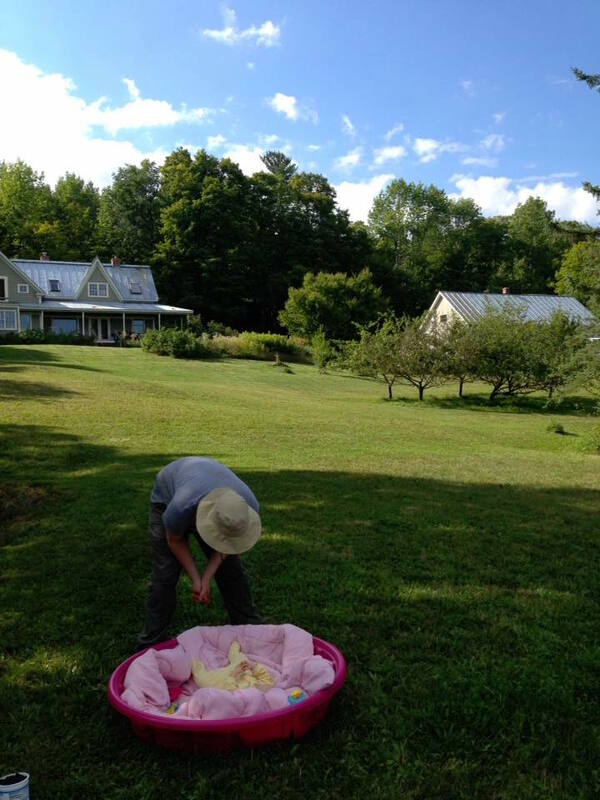 I’m on the homestead, frugaling it up with Mr. Frugalwoods, cleaning up greyhound barf (thanks, Frugal Hound… ), weeding the garden, not wearing make-up, baking bread, and letting Babywoods eat my toes while I write (at least they’re clean?). But these past two weeks, I’ve deviated. I’ve been on the road, in the air, spending money, and otherwise indisposed. To that end, this post has relatively little to do with frugality, but a great deal to do with my life. It all started three weeks ago when Mr. FW caught a gnarly stomach bug. The kind of bug that makes you vow you’ll never eat again. He was nearly incapacitated as evidenced by the fact that he reclined on the couch and watched TV during the day–a sure sign of his imminent demise. As a man who chose to read a book over watching TV while waiting for a root canal a few years back, I knew he was in a bad way. I forced him to call the doctor, who was alarmed enough by his symptoms that he sent us straight to the hospital. We then got to experience a day in the ER with a baby (complete with IV fluids), and a trip to the grocery store to buy Pedialyte (not for the baby). Yum. Of course this was two days before departing on our multi-city, multi-week trip to visit family and attend a conference. On an airplane. And, despite our best hand-washing, germ and contact avoidance techniques, I came down with the same malady the day before our trip. This being my second experience with air travel while suffering an intestinal ailment–the first was a case of food poisoning on a flight to Belgium a few years ago–I consider myself a veteran. Walk slowly and carry lots of water. Since our woods abode is an hour and a half drive from the airport, I packed a separate bag so that I could change Babywoods into her traveling clothes in the airport parking lot. Totally worked and we entered the airport with fresh clothes, fresh diaper, and a well-rested baby (thanks to her napping during the car ride). Don’t get jealous, it was pretty much downhill from there. Babywoods was jazzed about the whole airline experience as there were large numbers of people to stare at (rudely), lots of non-toy foreign objects to grab (the tray table being her favorite), and repeated application of bananas (now googling: is it possible to overdose a baby on bananas?). Mr. FW and I haven’t checked a bag since airlines started charging for the privilege, but we had to break that streak with Babywoods in tow. Since I flew solo on the second and third legs of our journey, there was no way I could manage a carry-on suitcase. With a heavy frugal heart, I checked one bag, gate checked our snap-n-go stroller plus carseat, and carried on Babywoods in my hand-me-down Ergo (babies not being eligible for gate checking), along with a backpack and purse. I did a dress rehearsal of this format in our house prior to departure, which was a wise move. I ended up keeping Babywoods in the Ergo the whole time and pushing the stroller with the carseat, carseat base, purse, and backpack loaded on. This meant Babywoods was content, my hands were free, and I wended smoothly through airport foot traffic. In a slightly non-frugal move, we purchased this carseat cover for gate checking and I’m glad we did. Our carseat arrived intact with nary a mar while the bag now bears rips and tears. Thusly laden with toys, food, wardrobe changes, mini-bottles of wine, and a blanket, Babywoods and I made it ably through security and learned that copious amounts of baby food and breastmilk are allowed. Thank goodness since I packed about 4 days’ worth and was ready to throw down (not in a polite way) if the TSA tried to tell me otherwise. Running out of baby food in an airport is not on my lifelong to-do list. 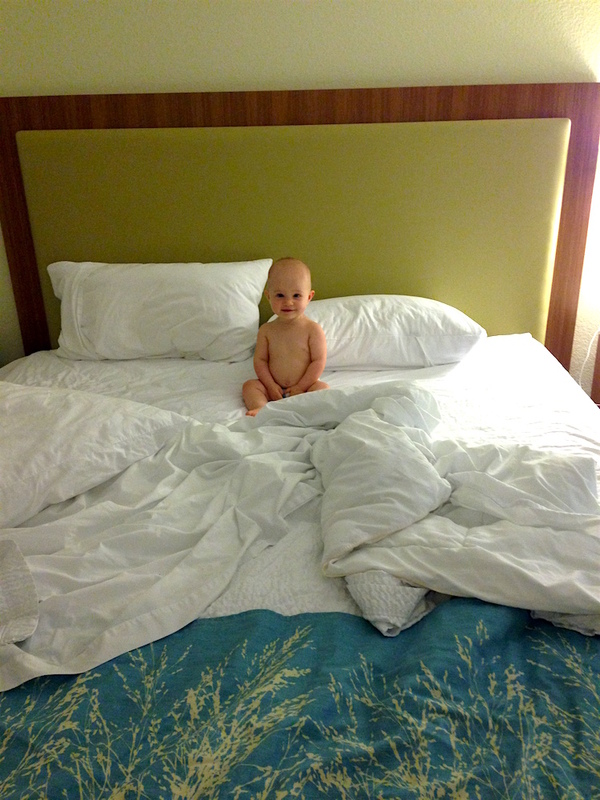 This was an all-suite hotel, ideal since there was an alcove for Babywoods’ pack-n-play. I began putting her to bed at home in a pack-n-play a month before our trip in order to acclimate her and, it worked! She slept like a champion baby. Except for that one night when I was in the throes of the stomach bug and elected to skip the family dinner out in order to get some extra rest. Naturally, that night Babywoods decided not to go to sleep for several hours. But hey, who doesn’t want to hang out with a screaming baby in a hotel room while sick? I know I wanted to. I kept checking the door’s peephole because I was certain somebody would call security about the inconsolable baby screaming epidemic taking place in room 405. I pictured a SWAT team. The micro flights to Florida (with a two adult to one baby ratio) were mere preparations for my cross-country solo-parent trek to San Diego, where my family lives and where I attended a conference. 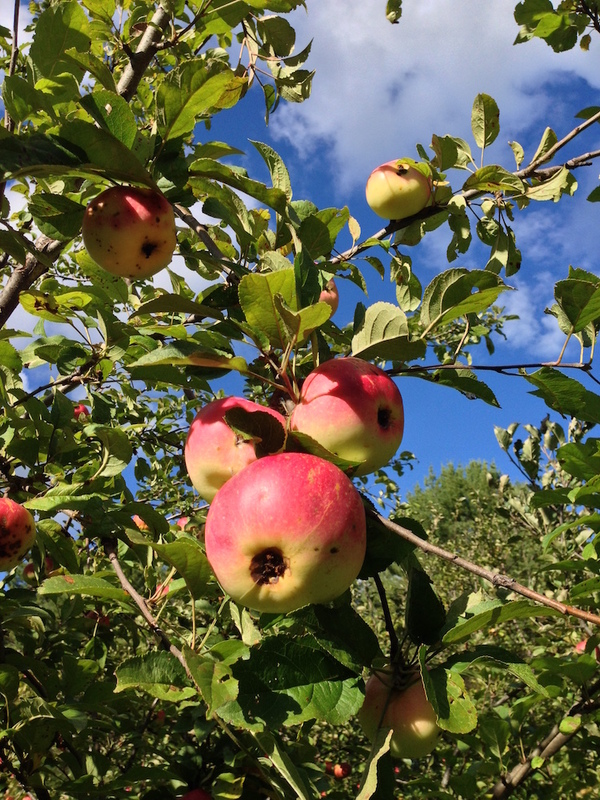 We decided to have Mr. FW return to Vermont to tend the homestead (this is peak apple harvest season) and fulfill his day job commitments (this is an extraordinarily busy time for his company). While flying with two parents was manageable, stuff got real when it was just me and Babywoods. Aside from both of us being covered in pureed carrots, a few pig squeals that made me wish I had a bag over my head, and that time I dumped out a bag of Cheerios on the floor of the plane and we both started crying, we made it. Fortunately, there was a compassionate social worker sitting in front of us and she reassured me and Babywoods during our crying jag. We both felt much better after she patted our hands, reassured me that I was a good mother, and let Babywoods play with her scarf. And hey, now I can say I cried on an airplane. Over spilled Cheerios, which I did feel bad about because they kept crunching underfoot and grinding into the carpet… yep, we were those people. Also, in case you’re wondering, it doesn’t work to buckle a nine-month-old into an airplane seat. I figured I’d try since I had a row of seats to myself, but Babywoods saw this as an opportunity to fling her body towards the backpack-o-toys, which was located on the floor. Not my best moment. In desperation, I let her play with an empty water bottle. And a full packet of pretzels. Also the flight safety information card. I brought a gallon-sized Ziplock of toys (good ones too! ), but she was far more interested in everything else. On my second solo flight–where I shared a row with two other (unlucky) people–I wised up. I wiped down everything in reach (back of seat, armrest, window, tray table, seatbelt, self). Then as a smug, experienced flying-with-baby parent, I allowed my daughter to do what she wanted: intensely play with the seatbelt. She promptly snapped her finger in the latch and wailed. I’m not sure if there’s a stronger word for wail? But that was it. Now all surrounding rows (not to mention my now-tragic seat mates) were staring at us as Babywoods beat me with her tiny fists and turned red from exertion. I quickly popped her on to nurse. She fell asleep in my arms and I inhaled. Following this thrilling experience, we landed in Denver only to learn that our connecting flight was delayed by three hours. Babywoods and I circumnavigated the airport several times (I was grateful I’d spent whatever I’d spent to check that bag), made friends with other babies, and played on the floor atop our carefully packed travel blanket. Ok let’s be real, she scooted off that blanket post haste and proceeded to lick the airport floor. She also ate 6 meals, thus validating my overpacking of baby food… and confirming my suspicion that I should’ve packed a change of clothes for me in our carry-on. I was encrusted with baby food and related detritus. Encrusted. And not in a subtle way. Once we boarded that tardy second flight, Babywoods was in rare form–she’d missed several naps and was no longer amused at being in my arms. Naturally, we did not have a row to ourselves and were instead sandwiched next to two other people–fortunately my seat mate had a baby and a two-year-old at home, and was not fazed. Babywoods kicks while she nurses (something I never noticed before this trip… ) and he was quite gracious about her little feet jabbing his arm. People are incredibly kind and, for unknown reasons, seem to like strange, screaming babies on planes. A saintly woman carried her up and down the aisle of the plane (it was only after she walked off with Babywoods that I realized I didn’t know this person… but I reasoned it’s an airplane and there aren’t many places to hide a loud baby). Other passengers also held her, played with her, gave her toys, and generally made my life easier. I live by the worldview that people are inherently good, and this trip proved me right. Thanks to this delay, the airline lost my one checked bag, which contained quite a few valuable items, such as: 1) all of my clothing; 2) all of Babywoods’ clothing; 3) all of everything else I’d packed since my carry-on was stuffed with $%&#ing bananas, baby food, and toys she wouldn’t play with. Luckily, we were headed to my parents’ home and they supplied us with necessary earthly possessions (toothbrush, diapers). Babywoods wore the same onesie for several days, as did I, and no one died. My bag showed up two days later (at 11:40pm, thank you very much) and there was much rejoicing. Doing a victory dance on stage after receiving my award. Photo courtesy of my friend Jason Vitug. In addition to visiting my fam in San Diego, I attended the annual financial bloggers’ conference (yes, that’s actually a thing). 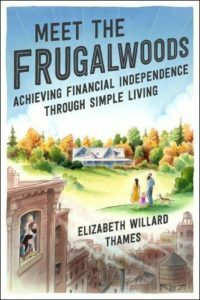 I am honored to share that, while there, Frugalwoods was awarded Best Frugality Blog Of The Year! Thank you all for reading! Totally made those flights-of-terror worth it. The reason I’m sharing this long-winded travel diary (other than to serve as my own personal parental venting system) is that I think it’s profoundly important to: 1) do what you love; and 2) spend money on the things that matter most to you. Frugality enables that. Since I don’t spend money for the vast majority of my year, the cost of flying to San Diego is nominal in the scheme of my overall savings rate. Frugality is about prioritizing and efficiency. It’s not about hoarding every last cent and depriving yourself of a full, meaningful life. So, yeah, I took a group of friends out for drinks at the conference. I also went out to eat—several times. I didn’t have to pay to attend the conference since I was a speaker, but I did pay for my hotel (not to mention parking at said hotel). And I’m not stressed or mired in guilt. This trip is also about spending time with family and friends. I value those relationships and so I don’t mind shelling out cash to facilitate them. There’d be no point to my frugality, or my impending financial independence, if I couldn’t enjoy every aspect of life. At the same time, I’m cognizant that I’ll return to a more stable level of frugality once my trip is over. Deviations aren’t a problem as long as they don’t lead to an overall uptick in spending. Babywoods and I are still out in sunny (read: hot) San Diego spending time with my parents, sister, brother-in-law, and Babywoods’ cousins. Of course I contracted a cold out here (despite the heat), but my stomach bug is gone, and I am grateful for the grandparental aid with Babywoods as I recover from this second illness. Since Mr. FW and I do most everything together, this is a challenging alteration from the norm. I miss him. A lot. But, that’s a good thing when I think about it. Missing each other and missing my usual routine is an indication to me that I love my life. And I can’t ask for more than that. Perhaps an easy, non-delayed return trip? But that might be pushing it. I’m OK with just loving my life. Tell me something about your life lately. Congratulations on winning best frugal blog! I also hope you feel better soon and have a relaxed return flight. Wow! What an adventure you had. Everyone came out alive and happy in the end. I probably would have stayed home after being sick with a stomach virus, since those things are so contagious, miserable, and not fun. Glad it all worked out for everyone! 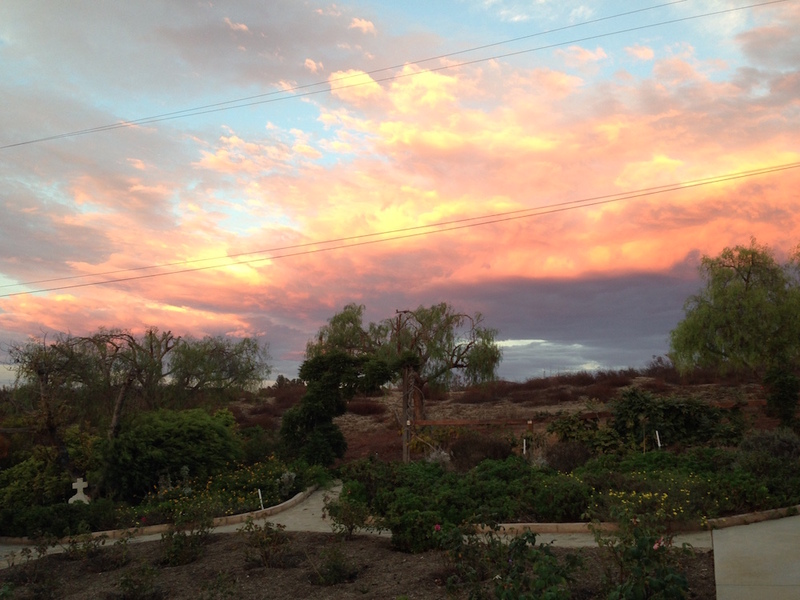 San Diego looks beautiful. 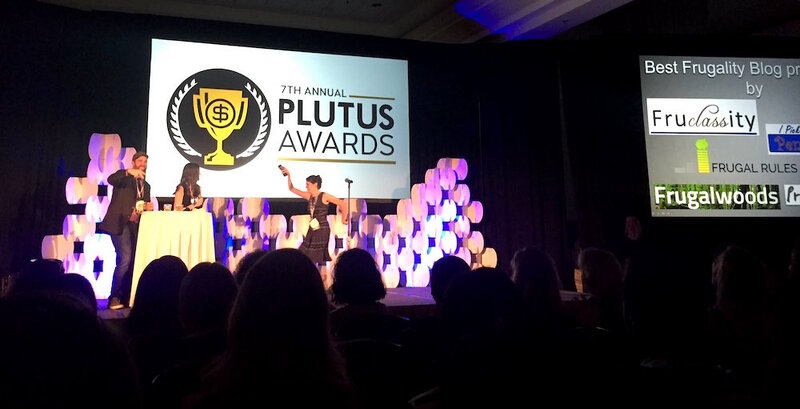 Huge congrats on the Plutus Award! We never checked bags until we traveled with a baby, either. At that point there is just too much gear (plus the baby) to carry. We called the kicking during nursing “milk legs.” It carried over once they were weaned to cow’s milk. No idea why they do that! When my oldest was 6 months old we decided to move to Europe. But first we had to visit all the far flung family in the US. From DC we flew to Nebraska, Oklahoma, Montana, and California. It was a great learning curve for me and baby! Because then I had to fly on the international flight alone with him. It takes a while to find your rhythm. But by the time he was 3 he had done over 40 flights and was a pro! I’m glad you had a great time at FinCon. With the breastfeeding baby and 4 other little kids in tow, it didn’t seem like the year for me. But maybe next year! As always, thank you for a wonderful post, and congratulations on your blog win!! Many congratulations on the award, it doesn’t surprise me in the slightest, I’m always excited to see another Frugalwoods post notification drop into my inbox. Kudos to you for your solo travel efforts. Flying can be tiresome at the best of times, but with a baby to keep amused…I cannot even imagine! I hope that your cold passes swiftly and you can enjoy the rest of this (I’m guessing) rare time with your family. Thanks for writing this post because its good for those of us aspiring to frugality that it’s ok to spend every once in a while on the important things. You’re too funny, love your descriptions. You’re one brave mama. I once flew with my first born when he was just two months old, but I had a couple of my sisters flying with me. It actually went pretty smoothly, as he wasn’t mobile, eating food, or needing to be entertained constantly as Babywoods is at this stage. He pretty much nursed and slept as far as I remember. Of course, that was over 18 years ago, so I may have forgotten. I don’t think I would have been brave enough to go if I had the stomach bug, though! Thank you for sharing a real life, even if not all so frugal, post and congratulations on the award at FinCon! Ah, traveling with baby, what fun. You are doing the right thing though, get them started early they will learn to love it as you do. Nursing is so key when flying. I still nurse my 3 1/2-year-old and I plan to shamelessly nurse him next time we fly, should anyone give me a sideways glance I will hand him directly to them. That’ll teach him ’em to judge. One frugal tip for you Vermonters, check flights out of Montreal when booking, especially when going to Europe. There are nonstop flights, which are good for baby, and the exchange rate is good at the moment. We saved about $1800 flying out of Montreal last year to Italy. We have to pay for Little Cheapheart’s ticket now that that he is older. Flights out of Boston were about $1500 each, but they were $900 each out of Montreal (and non-stop). The five hour drive each way was worth the money we saved. Just make sure you have enough time to cross the border in case there’s a back up (don’t ask me how I know this). Also, make sure you have gas in your car as well. As it turns out there is very poor cell service and few gas stations after the border, learned that the hard way too. Even if you stayed the night in Montreal and noshed on some delicious poutine, you’d still be saving (plus enjoying and experiencing). Congratulations on the award! Richly deserved! Your blog has been one of my favorites since I started reading you a few years ago. Congratulations on the FinCon award! !! Flights, sound rough, but I can empathize! I am a single mom by choice and I have two kids (now school age) – have flown solo with one or both and perfected it! First, I always, always, always buy a seat for the kids – I figure that since you can’t even hold a laptop on your lap during takeoff, my kids deserve the safety of a being buckled into their carseats when flying. Don’t want to over – frugal when it comes to their safety, plus then I don’t have to gate check the carseat, because we use it, and for them it is familiar and somewhat similar to being in the car. Second – Direct flights whenever possible! I live in Boston, so this is almost always an option. Generally cost more, but again, I feel this is why I am frugal all the rest of the time. I did not check luggage – not because of cost saving, but because I was too fearful of it being lost by the airline. I was somehow able to have kid in a my great travel stroller with a regular (non – umbrella) handle so I could push and turn easily with one hand and I pulled along my suitcase with the other, had the carseat on one shoulder using the straps like a backpack and was able to put small back pack with important in-flight stuff in the under stroller basket. Once I get to the gate, I was shameless about asking for help with the carseat by getting someone (airline or other early boarding passenger) to bring carseat to our seats, then I gate check the stroller and carry baby to seat myself, pulling the suitcase and putting it in the overhead. Since we boarded early, it was easier to get overhead space. Reversed it all on landing. Not sure I could handle not checking the luggage if we had to change flights. When I traveled with two (infant and 4 year old), the 4 year old could actually help by carrying backpack, and I got a even more sympathy and help then she I traveled with a single child. M y whole system fell apart when y checked stroller was lost on a direct flight from Boston – Heathrow (where the walk from the gate to the terminal is really long! ), but I ended up getting the airline to give us a ride on one of the golf car things. Finally a hint- A great thing for kids babywoods age is scotch-tape or post-its! They are fascinated with the stuff and it will keep them busy for quite a while…and both are easy to remove from the seat back or tray table! Sounds like you had a few angels on your flight. Hope you feel better soon! Have a safe trip home! I hope you are taking Vitamin D to boost your immune system (plus it protects against cancer among other diseases) Get the liquid form, comes with a dropper. Especially important during the fall & winter months. Congrats on the award! 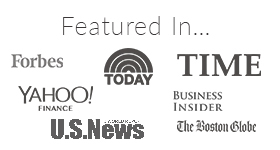 I hope it helps bring a larger audience so that more people can learn from you. OMG….I was reading this and feeling nothing but absolute compassion for you. Many years ago, I traveled with my then six month old on a 2 1/2 hour airplane ride. It was nothing short of a nightmare- crying, baby vomit, more crying, tons of dirty looks…… I may have even cried out of frustration but I don’t remember- I’ve tried really hard to block out the memory of that flight!!! Sadly, people on my plane were not nearly as kind as yours! Thank goodness for that. Wishing you an uncomplicated flight back home and a speedy recovery! PS- congratulations on the award!!! I feel bad laughing at your tribulations and trials, but the way you wrote it was so hilarious! Sorry to hear it was such a struggle. I had no idea you were sick at all! Congrats on your award, and thanks for giving me something entertaining and valuable to read! I love heading out on trips yet am always happy when it’s time to come home. It’s a lovely cycle that makes me grateful for the adventure as well as for the comfort and loved ones at home. Stories of traveling with a baby… always more entertaining to those who didn’t have to endure it, and probably more amusing to you after the fact! Thanks for sharing, and congratulations on your award! I eagerly await your new posts every week! Anyways, appreciate the story. It reminds us to bring our A-game, stoically, while bringing-up ze bebes. I realize the more I go out with our 6.75-month-old son that people love babies. Being that you spend a lot of quality time with your daughter showing her love, outside of moments of her frustration about being hungry/bored and not being able to communicate that (ie–crying and screaming), she sounds like a good-natured baby. All that babies need is love, interaction, rest, and a full belly! And it seems from your blog that you all shower your daughter with love and good quality time which in-turn makes for a happy baby. My mom takes care of my son during the day so I think he’s in a similar boat. As a result, when he’s out in public, people love him and want to come up and hear about him and talk to him and make him smile. So I imagine a part of the reasoning for people being so kind to you on this trip a) saw you were a caring mother traveling by herself so they wanted to help and b) love babies so they want to help even more! Plus down the line, when your kid(s) is(are) all grown and you’re flying with a single parent with a baby near you, you will know the experience and want to repay the kindness you received on this flight (and perhaps many more flights). Things like your experience on the plane reinvigorate my belief that humans are good-natured. Quick question–I saw your cute instagram photo–does your daughter ever want to be faced-out in the carrier? My son never liked being carry-in so when we’re out in public we have to do the carry-out (so I did end up buying a second-hand lillebaby on eBay). But carry-out does not make sleeping easy, lol! The trip sounds — eventful. You can laugh (now) about it, so that’s all good. I traveled with my sister, her three year old and under-one year old on a plane with connecting flights, and remember that trip well. So very well. I totally have walked out of the plane smeared in many things from my kids. We flew Denver to Hawaii last year with a lap child. We tend to try to fly Southwest airlines, since 2 free checked bags is quite handy with children. I also appreciate their no change fees. Love the blog too. Congratulations on the award. Congratulations on winning the award. You certainly deserve it! I was unfortunately stuck at my W-2 job that week and unable to attend. Hoping to be there in 2017! It sounds like you and Babywoods had quite the travel experience. Although, not ideal, it definitely makes for great memories and,I’m sure, an appreciation of life on the homestead 🙂 Glad you two made it back safely! Oh, Mrs. Frugalwoods, you scare me! I will be flying solo with my 6 month old in November (including connecting flights)! I was looking forward to the trip but now, I’m not so sure… I’m also flying to Europe with both of my kiddos in December (they will be 3.5 and 8 months then) but at least my hubby will be with me. Fingers crossed for meeting some friendly strangers on my upcoming trips! PS – Congratulations on your award! I love reading your blog and always look forward to your new posts. I also recently traveled with a 10 month old baby and the best $350 I spent that entire trip was on the airplane seat so the baby could hang out in his carseat. The round trip was comprised of five legs and looking back, I would have spent DOUBLE to ensure that we could bring the carseat long. Also, 10 month olds are very adept that removing airplane seat belts. Next time I bringing a rubberband to keep that sucker closed. It held my son’s high back booster, my daughter’s convertible seat, all the diapers and wipes we needed for our trip — and on United, at least, you can check 1 car seat per kid for FREE. On the way back we stuffed my husband’s hunting boots in there too and saved ourselves a ton on baggage overages. It survived our entire trip without a single rip. You are now a travel with a baby veteran! Good for you, and hope that you feel better fast! Love the real post! Although I must say, it makes me a bit nervous as my husband and I are taking our 3 nieces (ages 4, 7, and 11) on their first plane ride to a surprise trip to Disney World (we’ve been saving up and giving them this experience is worth spending the money to us). So imagine 2 childless people traveling with 3 girls who have never been on a plane before. Should be smooth sailing, right??!?! (I can hear you laughing here in Kansas). I only hope we encounter the same generous people on our flights that you did. Somehow I fear a wailing 4 year old isn’t as cute as a baby. Congrats on the award! I think you win Aunt Of The Year for that :)!!! You’ll be fine; they’ll be so enthralled with the experience! Well done. Flying alone with baby is one of life’s hardest challenges in my opinion. I get very frustrated with people who get frustrated with babies on planes. They have a right to be there just as much as anyone. So glad to hear about all the kind people you encountered. Hooray for humanity! Congrats on the award and keep it up. I love following along your adventures. People don’t get frustrated with babies and children on planes. They get frustrated with parents who do zilch to control their kids. If a parent is honestly making an effort to calm a baby or rein in a toddler, I feel sympathy for him or her, and there have been a couple of times where I’ve held a baby so Mom could get things stowed away or distracted a little kid with meowing (I found out years ago that little ones LOVE meows). However, if a kid is raising hell and Mom and/or Dad is too busy playing games on the phone or gets belligerent if you politely ask for them to restrain Junior from kicking the back of your seat, THAT’S what we hate. I’m single/no kids and have had a lot of fun helping parents traveling with kids by playing peek-a-boo through the seat cracks, making funny faces, holding the baby, etc. I would suggest googling “travel with baby/kids” before any trip. I have collected so much advice that has saved us, like the tip for slightly older kids to take a trip to the dollar store and wrap the toys as surprise presents. Each one lasts 20 minutes or so, but those 20 minutes are worth $1. Having plans, back up plans, and if all else fails a sense of humor is really important. UGH on the stomach bug, especially a day before travelling! You are a champ to travel like that. When I was little, my parents used to take us to a hot dog stand that had kiddie rides. The place gave everyone a certain number of ride tickets with their food purchase. So Mom would dress us up in our cutest outfits, and those without kids in tow would inevitably say “Awww, what adorable little kids… would you like my ride tickets?” And it always worked! Not sure if this falls in the category of parenting hack or frugal hack, but suffice it to say people are more generous – Be it ride tickets or crying – with adorable children, so make the most of it! Although baby woods is so freaking cute, you probably don’t have to try very hard. 🙂 Congrats on the award… You certainly deserve it! I’ve flown with my four kids a handful of times. Now that they’re getting older it’s much easier, but it used to be an absolute make-me-want-to-take-up-drinking type of experience. I would feel like a bad parent whenever one of my little guys would start to cry during the flight and someone would throw an accusatory glace my way. As if I wasn’t already aware of the situation and doing everything in my power to “calm the beasts.” These days when I fly, it’s usually by myself and I secretly hope that I get to sit by a passenger with unruly kids – that way I can act as a bit of a buffer for the stressed out parents and offer whatever help I can. I know how terrible it can be to fly w/ kiddos and I like to help. 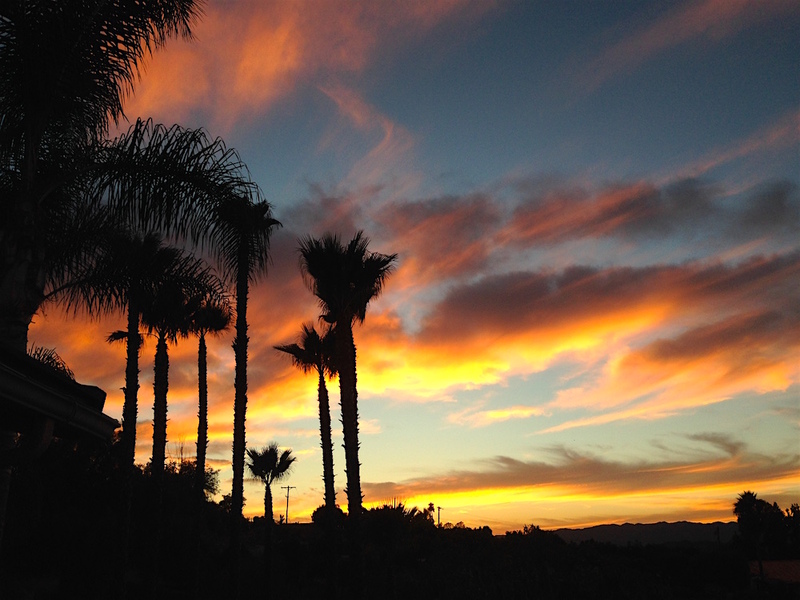 Hope you’re enjoying your time in Sunny San Diego! Congrats on your well-deserved award! And it was fantastic meeting you!!! Congratulations on the award for best frugal blog! And you probably should get an award for traveling on a plane with a baby. I’ve done it, so I definitely know what a chore it is! Is this a frugality blog? I thought it was a humor, rational venting journal that makes me cry laughing tears! Congrats on your award. Hope you are doing well. Many congrats and well done on the plane travel! Love your blog and hearing all your tales. Enjoy the rest of your break. Oh my goodness, what an adventure, you’ve been having. It’s a beautifully-written post. So funny! You kind of sound like a Millennial-style Erma Bombeck. Hopefully, your return flight will go smoothly. I wholeheartedly agree! Love Erma Bombeck – maybe that’s why I love Mrs. Frugalwoods. Congratulations on your award! Hope you have a safe & sane trip home. Congrats on the award, Mrs FW! Very well deserved! That sounds like one trip from hell, I’m so sorry to hear that. My wife and I have a 2 year old and trust me when I say, as a parent, you have plenty of company. We’ve each had the opportunity / pleasure?… of traveling solo with him and there have been good and bad trips. I hope this doesn’t discourage you from traveling in the future with babywoods. It isn’t always that bad. I will say though that delayed flights are just the worst. We spent 9 hours delayed with our little one this summer. They airport was packed, dirty, no toys (bad planning on this trip) and our flight finally took off at 11 PM, landing at 2 in the morning. It was absolutely horrible. How exciting to be recognized for your good, common, frugal sense! I always love reading your blog, but this one was the winner! As I have said, you are a very relaxed mom, and I think that helps with how Babywoods reacts to situations. For the most part, it sounds like she was pretty adorable and easy. I also like this statement: ” Frugality is about prioritizing and efficiency.” Exactly how I feel. I also need to say thank you. Since you introduced me to Personal Capital, my spending went down $428 in one month! Win!! Your travel story with babywoods is too funny! thanks for sharing and congrats on the award. Good luck on the journey home! Great post. Sounds like you (and Babywoods) did fine in the end! Congratulations on winning your award!!! I kept checking the blog for a new post as I was totally missing your insightful, smart and funny posts. You are definitely doing something right because I suspect I was not the only one looking forward to reading more. Anyway, congrats on the award and kudos to you and your baby on surviving the long treks. As a mother of 3, just one word on your trip.. Yep. As a Frugalwoods follower, Huge Congratulations on the deserved award!!! oh, good lord. I read parts of this out loud. you are a trooper! I hope your return flight is uneventful. thanks for the drink! Haha, parenting is always an adventure, no ;)? It was so great to see you! Congratulations on winning the award. Is this your first time? Good luck on your blog, Frugalwoods. “now googling: is it possible to overdose a baby on bananas?” – Not in my world. JuggerBaby has consumed two whole bananas in ten minutes before with nary a side effect. “…proceeded to lick the airport floor…” It’s both hilarious and comforting when other people’s babies do this. My relatives were horrified to discover that JuggerBaby would lick everything including the floor, our shoes (no no, not the top, the BOTTOMS), the dog, our toes, doors… everything. At this point, ze has to be inoculated against every possible germ by virtue of ingestion. But I’m glad you made it out and glad I caught you for a few minutes before your roundtable discussions! I would have loved for JuggerBaby and Babywoods to meet – JuggerBaby considers zirself the premiere expert on infants, and would have offered cuddles and all the food ze was eating. PiC actually flew the two of them solo to and from FinCon so I wouldn’t have to spend my birthday without my family – flying alone with a toddler who’s constitutionally incapable of sitting still, that’s real love! It’s nice to miss our loved ones on occasion, I think it helps us not take them for granted. I’m wishing you all good health and a smooth, non-delayed flight back! Haha, yes to licking everything! Why do they do that 😉 ?! Awww too bad we didn’t get the babies together–there were so many kiddos at FinCon this year! Many congratulations on your well-deserved Plutus Award. Delighted you won, especially after recommending Frugalwoods to the UK moneybloggers community. Do hope you and Babywoods got to enjoy FinCon after such an eventful journey. I was definitely nodding along with some of the trials and tribulations of flying with a baby after my own experiences on planes with an infant in tow (Should have packed a change of clothes for me and not just the baby? Check. Wish the earth would open as my baby screamed throughout the entire “fasten your seat belts, we’re about to descend” period? Yes). After one particularly (ahem) eventful trip, with a potty-training toddler and breast-feeding baby, I swore off flights for a while but we have ventured back on board since. Good luck back in Vermont. Mother of 3 here. I once flew (3 hour flight) with a 3 month old and a 2 year old. It went well actually. They slept, both in my arms, for most of it. I love your blog and I am so excited that you have won best financial blog of the year! You deserved it. You make me laugh every time and I read something on here. Congrats! Congrats on winning the best frugal blog award. My wife fly cross country with our son when he was four months old by herself. I unfortunately had to work. She was terrified but like you had the help of strangers comfort our son along the trip. I’ll never be able to thank those people but I will try to pay it forward when given the chance. Congrats on winning the best frugal blog! (Yours is the only one I read, & I think it’s great! I’ve learned from you guys!) 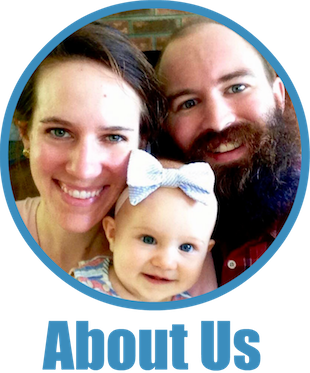 Be sure to copy this blog & put in Babywoods Baby book! Someday you’ll laugh at some of these things! Of course you won!!!! Yay!!! Good going on the traveling…always seems to be someone to help when we’re in need! We have 6 kiddos and when we only had 3 (under age of 4!) hubby and I travelled with The Tribe to California from NJ to visit the relatives. I remember hubby and I looking at each other with that “what were we thinking??? !” look. It was memorable! This was quite an adventure! Congratulation on your well-deserved award! Hope you feel better now. I can only say that flying with a 4-years old was unexpectedly easy for me. So it does get better and easier. I don’t dare to take my 2 years old on a flight. At least, not yet. She’s moving a lot and all the time and I have a hard time following her all over the place. Even if it was hard, you did a great job. I’ve enjoyed every word of your story. Have a pleasant flight back home! Congratulations again for your award! Thank you for sharing the fun and woes of your trip. I was very touched by the kindness of your fellow air-travel mates. Most people love babies and small children. I just want to add that I purchase my airline tickets with a credit card that offers travel insurance, including lost or delayed baggage insurance: $500 for each bag delayed more than six hours! Perhaps you have the same? I use to be a flight attendant, and I felt you in this blog post. Great writing and I wanted to give you a high-five on traveling with an infant. This can be a feat. The delays, the crowds, the security, the lack of entertainment, the abundance of germs all can be a traveler’s worse nightmare, especially when that traveler is a parent! Congrats on your award, I love your blog! Oh, you poor thing! Can’t be easy flying solo with a baby. Well done, though – you got through it in the end and will be an expert next time! My friends often remind me that every terrible situation just turns into blog fodder, and you have proven this true once again. I’m so, so sorry for your flight experiences, but laughed out loud when you handed off the baby to a stranger. I’ve had a few 9 month olds, and I handed those kids off to anyone who would take them. Your trip of lost luggage and frugal-ness totally inspired and grounded my thought process. I just spent multiple days of adventurous airport travel and 2.5 days without my luggage and did just fine. I spent minimally, whereas this would have been something I would have used as permission to spend previously. Thank you! I took full advantage of the free foods offered by the airline, re-wore my clothes and borrowed where I could. Traveling tip with baby…wear a baggy smock over your clothes so that mess stays on smock…then you can whip it off on arrival. Smock for baby too, perhaps only minimally successful but much easier than either changing clothes. I find airline works very helpful and will provided golf zippy carts or wheelchairs when asked. Good luck! Oh my goodness, I totally get the traveling with kids… have done it multiple times solo with 2 kids, overseas to visit family and it can be HARD! I laughed so hard reading “Ok let’s be real, she scooted off that blanket post haste and proceeded to lick the airport floor” … the bright side is that after they do this you never ever worry about run-of-the-mill germs again. Mine are older now, but some of my favorite tricks from when they were little are 1) always pack a full change of clothes for all parties (2, for anyone recently toilet trained); party sized bubbles are great for waiting in line and for in the plane too; lots and lots of food (you seem to have this one covered! ); stickers… my oldest, at 3-y-o, spent a good couple of hours sticking stickers on top of each other in a stack in the middle of the night, while I got some much needed sleep because I couldn’t keep my eyes open any more. Love reading your blog and all your suggestions!